I will explain a little, now that I have tired of studying, because the article of Nature that I put this morning is so interesting or, at least for me. Some time ago I talked about how we went from the smallest to the largest, from the sub atomic particles and how these quantum level “talked” to each other until our galaxy was not “alone” and had company of something called “supercumulates” Being the interactions between the galaxy itself that discovered the existence of dark energy (by angular momentum) and how dark matter was a consequence of the interaction between galaxies. That is, all elements of nature, in the end, interact with each other in some way (mainly by electromagnetic forces and strong or weak attraction or repulsion) and do so on any scale. We can calculate how much of “matter” and therefore of energy there is not directly but through seeing the interactions of the elements. That is to say, measuring things directly is complicated, you can not see “how much energy” a car has when moving, but if you can calculate it through the interactions it makes with other elements (either to calculate potential or kinetic or Even heat it by measuring the temperature or how it warms your environment, among other things). Observing the distribution of galaxies, their supercumulates and the interaction between them we can learn many things. For example, we can understand the speed at which the set moves or how one galaxy is attracted by another and therefore calculate the mass of the galaxy. These things can help you understand such important issues as background radiation. As you know (and I will be brief) the cosmic background radiation is the residual temperature that has been left by the big bang as the universe enlarges. This radiation is not constant but has different densities. The different densities explain how, during the big bang and the later expansion there were areas with greater density of energy and matter that are the precursors of the galaxies since where there was more energy, there was more matter and therefore more possibility with the expansion That it collapsed and formed many more stars. That is, cosmic background radiation helps us to know the distribution of galaxies in the universe. 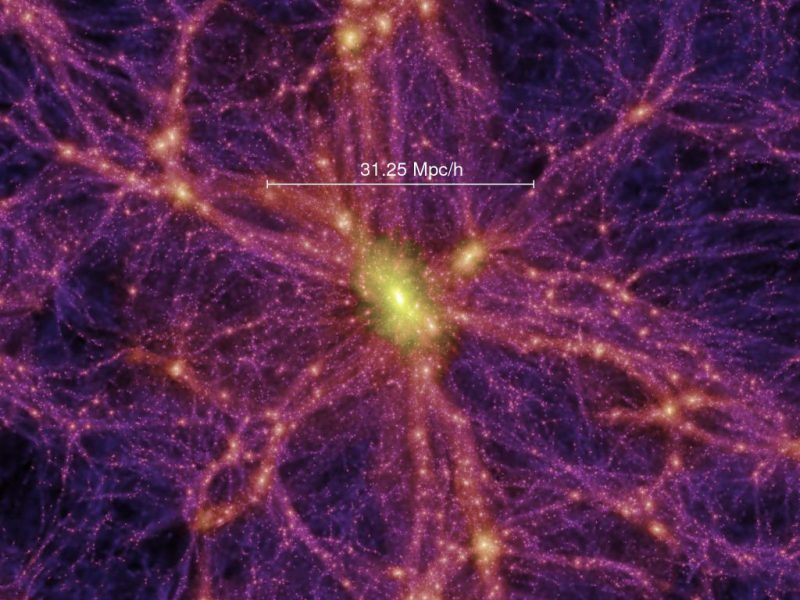 But because galaxies and clusters of galaxies interact with each other, the distribution of background radiation may not be accurate because there are so-called “filaments“. Filaments between galaxy clusters are nothing more than virtual elements (not visible to the naked eye) that contain gravity vectors. 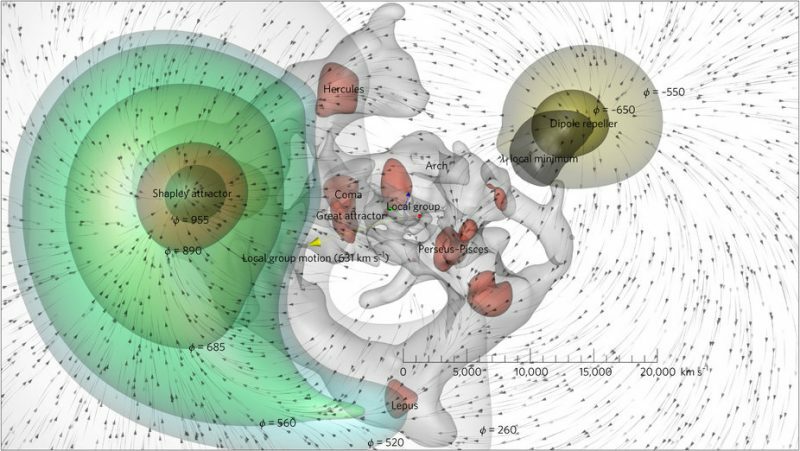 That is, more simply and as an example, we can consider the filaments as gravitational “strings” that join the clusters of galaxies and allow them to interact. So, like small threads that unite the fabric of the universe by keeping the galaxies and groups of galaxies united, as if it were a spider web, the web of the universe (cosmic web, for friends). The nature article by Yehuda Hoffman, Daniel Pomarède, R. Brent Tully and Hélène M. Courtois is about the calculation of how these filaments interact in time since, being “ropes” of gravity varies with the position of the elements, And the calculation and forecast of how this affects the cosmic background radiation. This allows or will allow a better knowledge of how these filaments work that can lead us to a much better knowledge about its composition which, it is believed by calculations (you know, first mathematics and then interpretation) that are composed mainly of dark matter And, therefore, can help to discover it and, above all, to calculate it much more easily. So, it’s an article that, for many, will go completely unnoticed and, to my mind by the way, it has a very important importance.